Paint and new hardware made a huge difference in how our bathroom cabinet looks. 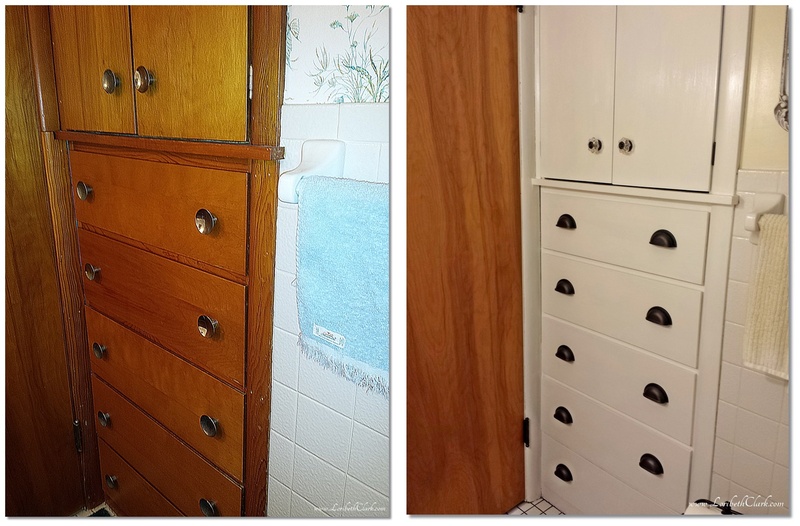 It also made a huge difference in how the entire bathroom looks. This cabinet had some serious issues that had to be addressed sooner rather than later. 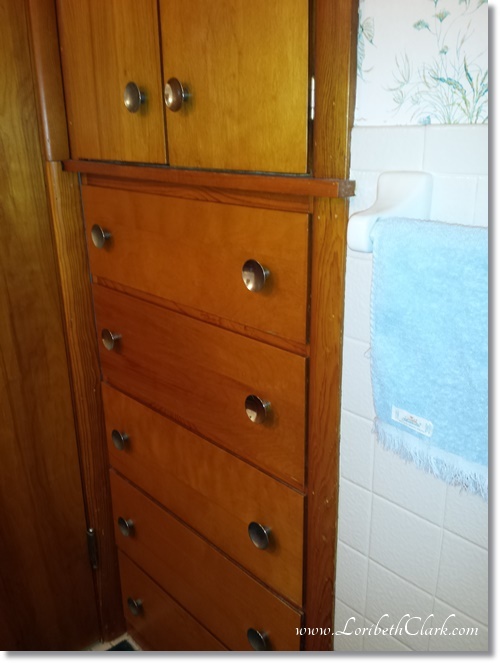 This is how the cabinet looked when we bought our house. 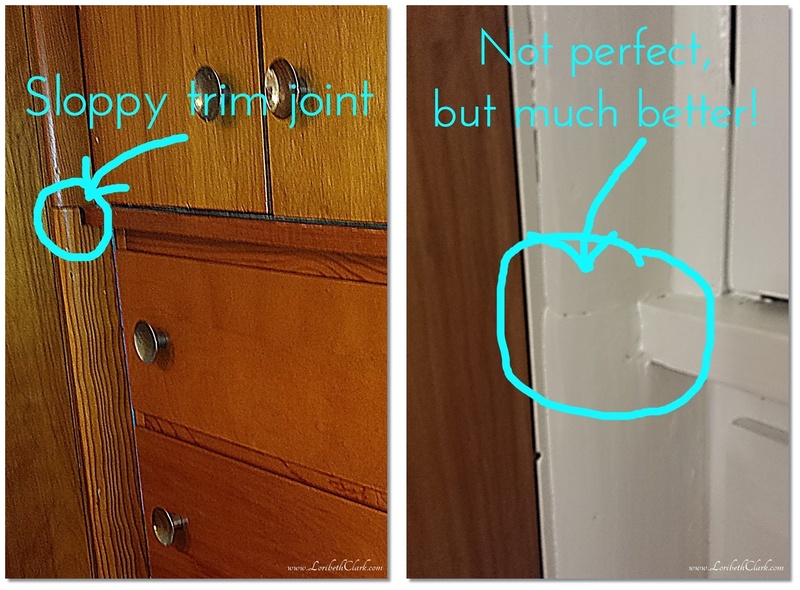 This cabinet has been a bit of a thorn in my side since we got our house. 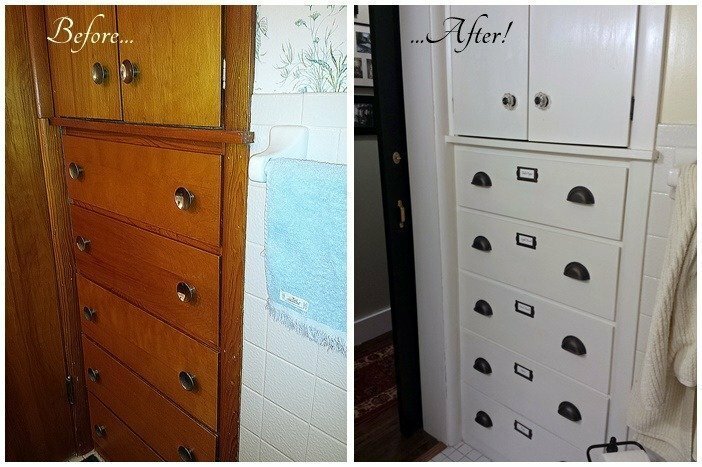 The first day we had the keys in hand, I took the contact paper out of all the drawers in this cabinet. The smell just about knocked me over. It smelled like…no I can’t even tell you what it smelled like, it was that horrible. The drawers stunk. Bad. What made it worse is the wood the drawer boxes were made of was unfinished, and the smell was in the wood. The smell was so bad, I refused to keep them in the house. I had to find a way to get rid of the smell and that wasn’t easy. I used odor remover, let them bake in the sun, used straight vinegar on them… I did anything I could think of to get rid of the smell. It took two months before the smell was gone and I was willing to bring them back in the house. Well, about a month ago, the towels started to smell. They just didn’t smell fresh when I took them out of the drawers. That just wasn’t…ah…no. No. I couldn’t deal with that. So I removed the drawers and painted every surface with a mold killing primer that’s supposed to kill any odor-causing bacteria. I’m hoping it does the trick because otherwise, new drawer boxes will have to be made. 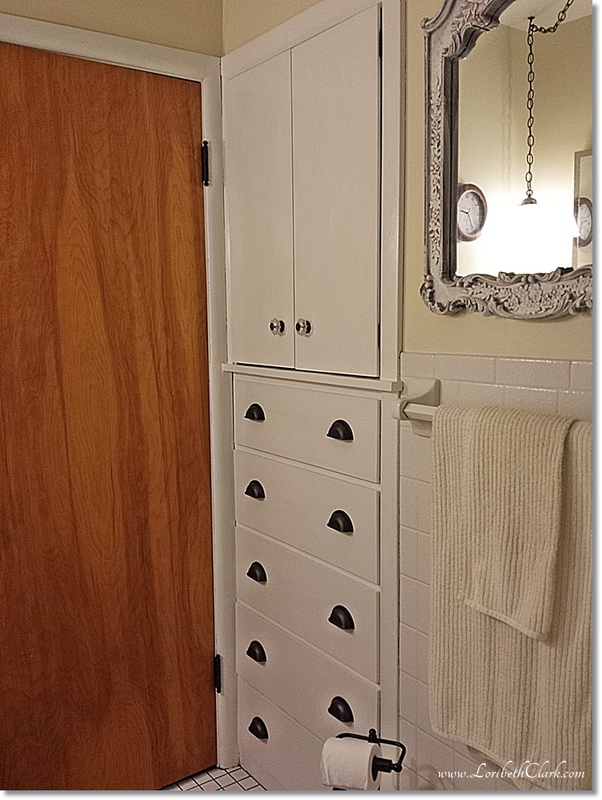 Since I had to paint drawers anyway, I decided to update the hardware and paint all the trim in the bathroom. It was something I’d been wanting to do anyway, and it was a good time to do it. 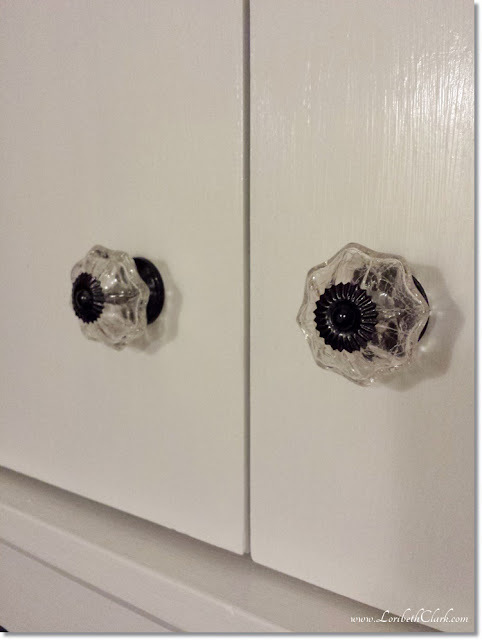 Jim had broken two of the artsy-fartsy knobs I had bought before, so this time I got cup pulls that feel really solid for the drawers. I spray painted the metal parts of these knobs. I didn’t replace the knobs on the doors, because I couldn’t find any I liked. 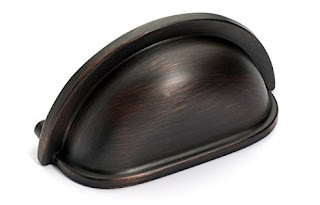 Instead, I spray painted the metal parts oil rubbed bronze, and I think they turned out great. Everyone always says updating hardware can make a huge difference, and it’s true. One of the things that always bothered me when I was in the loo, was the way the trim pieces were joined around the cabinet. I always looked at that joint and it just bugged me. Before and after of trim joint that always annoyed me. So when I decided to paint the trim, I also decided to sand this joint so the pieces were more flush with each other and then I filled it in with some wood filler. It’s still not perfect, but I don’t find myself staring at it all the time now, and that’s a good thing. The bathroom still isn’t finished. It has a major renovation in its future. But for now, I’m much happier with it. And I’m keeping my fingers crossed that the smell doesn’t come back!